Bangkok Airways is planning relatively ambitious fleet and network expansion over the next year as the independent full-service carrier looks to cement its position in the increasingly competitive Thai market. The carrier plans to add five A320 family aircraft by the end of 2014 and is close to placing orders for new-generation turboprop and narrowbody aircraft. The fleet renewal and expansion could be partially funded by an initial public offering (IPO), which Bangkok Airways now aims to complete by the end of 2013 following a six-month delay. The upcoming launch of three new low-cost carriers in Thailand, starting with Thai Lion on 04-Dec-2013, provides a potentially challenging backdrop to an IPO. But Bangkok Airways, which has been profitable for four consecutive years, is confident in the long-term viability of its boutique carrier niche. The carrier’s outlook remains relatively bright, boosted by an expanding portfolio of partnerships which will continue to provide high-yielding passengers that keep it largely out of the crossfire between LCCs. Bangkok Airways is the fourth largest carrier in Thailand, behind Thai Airways, Thai AirAsia and Nok Air. It currently accounts for about a 14% share of domestic seat capacity and a 3% share of international seat capacity, according to CAPA and Innovata data. Bangkok Airways is planning to focus primarily on domestic expansion over the next several months. The expansion will see Bangkok Airways grow its domestic network to at least 11 destinations as well as add capacity on several existing routes, including markets that will be served by start-ups Thai Lion and/or Thai VietJet. Bangkok Airways has traditionally had a relatively small domestic network, focusing on leisure destinations that see high demand from international connecting passengers. Over 75% of the carrier’s domestic traffic currently connects to or from international flights. 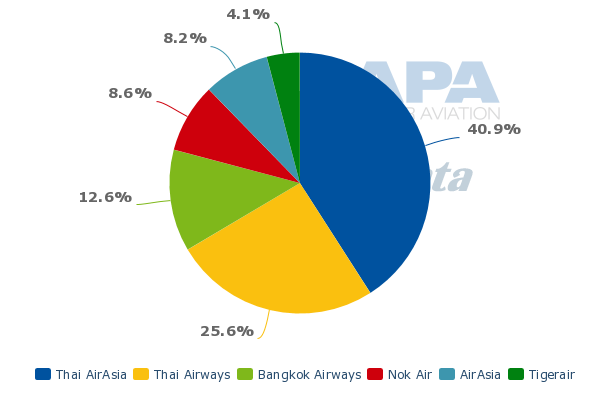 Bangkok Airways currently codeshares with 12 foreign carriers, four of which have been added over the last year – Japan Airlines, British Airways, Qatar Airways and most recently Cathay Pacific. Bangkok Airways executives tell CAPA that a planned new codeshare with Qantas is now slated to be implemented in early 2014. Almost all of the carrier’s new partners in recent years have been from Asia Pacific and the Middle East while Etihad has emerged as its largest single partner. The focus on growing links to carriers in Asia Pacific and the Middle East is part of a diversification strategy to reduce Bangkok Airways’ reliance on European carriers. Sales in Europe now only account for about 15% of Bangkok Airways’ revenues, down from 70% a decade ago. Bangkok Airways now has a relatively even spread of sales from Europe, the Middle East, Asia and Thailand. Local sales account for about 30% of the total pie, although that also includes a large number of foreigners who buy domestic and regional international tickets after they arrive in Thailand. About 200 passengers per day buy tickets at the Bangkok Airways office at Suvarnabhumi Airport on a walk-in basis after disembarking from international flights. The more diversified partnership base is enabling Bangkok Airways to pursue capacity expansion without having to compete head to head with Thailand’s fast-growing and now intensely competitive LCC sector for local passengers. As flights from Europe arrive in Bangkok at different times than flights from the Middle East or North Asia, the bigger partnership base also supports a higher number of frequencies across the domestic network. The larger number of frequencies in turn enables Bangkok Airways to pursue more high-end local traffic, including same day business passengers, which have typically flown on Thai Airways. Having more partners also provides a traffic base sufficient to support routes to new destinations. Bangkok Airways specialises in providing its partners with offline connections to secondary destinations throughout Southeast Asia which have growing tourism sectors but are generally too small to support non-stop long-haul services. Southeast Asian LCCs generally have not yet hybridised to be able to support connections with full-service carriers. AirAsia, Nok and soon Thai Lion also operate out of Bangkok Don Muang Airport while Bangkok Airways’ base is at Suvarnabhumi, where all full-service carriers are located. In addition to its 12 codeshare partners, Bangkok Airways has a much larger group of interline partners, of which Emirates is the largest. 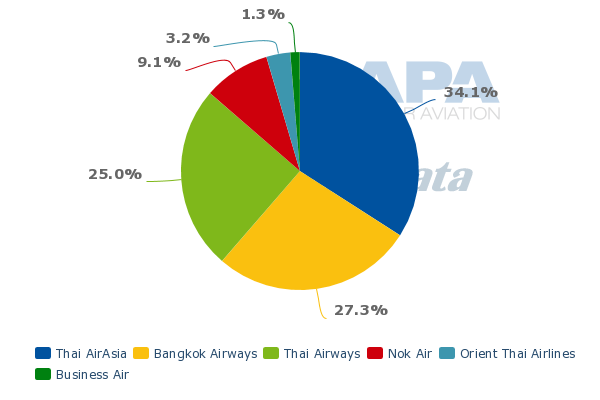 As CAPA previously reported, the interlines generate about five times as much revenue for Bangkok Airways as the codeshares, although the codeshare partners have been growing in importance. Overall interlines and codeshares account for over 50% of the carrier’s revenues, providing it a healthy and viable base of business as competition intensifies at the bottom end of the Thai aviation market. Bangkok Airways will continue to rely heavily on interline and codeshare passengers but is also keen to start testing out markets that consist predominately of local traffic, starting with Udon Thani. Bangkok Airways is launching service on 29-Nov-2013 to Udon Thani, a city in northeast Thailand which does not generally attract tourists. Bangkok Airways will initially serve Udon Thani with two daily A319 flights from Bangkok Suvarnabhumi with a third frequency to be added on 01-Feb-2014. Bangkok Airways executives expect international connecting passengers to account for less than 10% of its passenger traffic at Udon Thani. But the carrier is confident it will have the schedule and product to attract a sufficient volume of local passengers, including business traffic. Udon Thani is currently served by Thai Airways' regional unit Thai Smile, Thai AirAsia and Nok Air, which operate a combined 12 daily flights to Bangkok along with a limited number of services to Chiang Mai and Phuket. Bangkok Airways’ three daily flights will give the carrier about a 14% share of seat capacity at Udon Thani in Feb-2014. Bangkok Airways’ entrance could be seen partially as a defensive move to enter one of Thailand’s largest domestic routes before Thai Lion or Thai VietJet. Bangkok Airways executives told CAPA on the sidelines of the 15-Nov-2013 Association of Asia Pacific Airlines (AAPA) Assembly of Presidents in Hong Kong that the carrier also plans to launch services to Chiang Rai in northern Thailand at the end of Mar-2014. Bangkok Airways intends to initially serve Chiang Rai with two daily flights, with an increase to three daily flights within six months. Three daily flights should give Bangkok Airways roughly a 15% share of total seat capacity at Chiang Rai, which has emerged as a popular northern Thailand alternative tourist base to larger Chiang Mai. As in the case of Udon Thani, the Chiang Rai launch could be seen as a move by Bangkok Airways to bolster its network as the overall domestic market becomes more competitive. 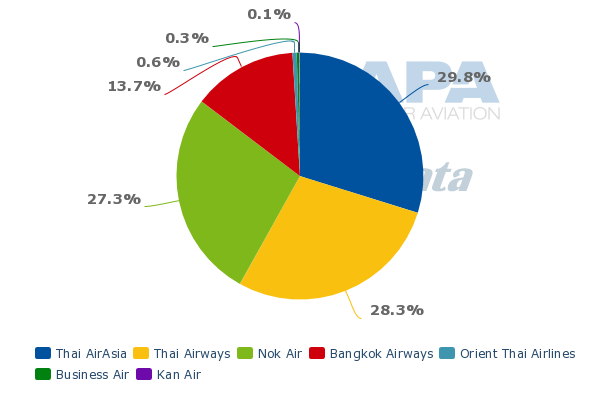 Bangkok Airways’ domestic network has traditionally been much smaller (less than half the size) compared to its local competitors. Bangkok Airways also launched a new domestic destination earlier this year, Krabi on the southwest coast. The initial performance of Krabi has surpassed expectations, giving Bangkok Airways confidence in pursuing further expansion of the domestic network. It also has led to Nok deciding to resume service to Krabi from 01-Jan-2014, giving the Bangkok-Krabi market four carriers and making it more difficult for Thai Lion or Thai VeitJet to potentially enter. Krabi is one of several domestic routes Bangkok Airways is increasing in late 2013, with a third daily flight from 01-Dec-2013 that will be operated year-round. The focus on Krabi, which is located about two to three hours from the more well known beach destination of Phuket, comes partially in response to a hotel and resort construction boom. But Bangkok Airways is also keen to grow its market share in Krabi as competition intensifies, with the upcoming resumption of service from Nok and the anticipated launch of service from Thai Lion. Krabi is one of several domestic destinations Thai Lion has cited as planned new routes for 2014, when the carrier expects to add several aircraft and start augmenting its domestic network which initially will only consist of Chiang Mai. In addition to domestic services to Bangkok from Thai AirAsia, Thai Smile, Thai Airways, Bangkok Airways and soon Nok, Krabi is served from Kuala Lumpur by AirAsia and from Singapore by Tigerair. Bangkok Airways will account for about a 13% share of total seat capacity at Krabi in Jan-2014. Bangkok Airways also has announced the addition from 01-Dec-2013 of an eighth daily flight from Bangkok to Phuket and a sixth daily flight from Bangkok to Chiang Mai. Chiang Mai is Thai Lion’s first route, with two daily flights launching on 04-Dec-2013 using 215-seat Boeing 737-900ER aircraft. Thai Lion recently began ticket sales in the Bangkok-Chiang Mai market with one-way fares starting at THB615 (USD20) including taxes and fees. Even the most expensive one-way peak day Thai Lion fare to Chiang Mai is only about USD50. Thai Lion also has announced Kuala Lumpur and Jakarta as destinations to be served with its initial fleet of two 737-900ERs. But while the new carrier has secured its air operators’ certificate from Thai authorities, allowing it to launch flights to Chiang Mai, it is still waiting for approval to begin international flights and therefore has not yet set a launch date or begun tickets sales for Kuala Lumpur or Jakarta. Several more domestic routes are planned for 2014 along with international routes to a mix of destinations throughout Southeast Asia, India and southern China. The entrance of Thai Lion and subsequently Thai VietJet, which plans to be based at a Suvarnabhumi but has not yet announced initial routes, will drive down fares from their already relatively low levels. In unveiling its marketing strategy on 19-Nov-2013, Thai Lion said it would offer consistently low fares, under-cutting existing LCCs which it believes have only been offering very low fares on certain dates or times. Nok and Thai AirAsia will be most impacted by the new competition as Bangkok Airways relies mainly on higher-yielding connecting passengers and for local traffic tries to focus on a different segment of the market. Thai Lion and Thai VietJet will not be able to - at least initially - match the schedule Bangkok Airways provides and that local business passengers generally require. For example, Thai Lion’s first flight from Bangkok to Chiang Mai will depart Don Muang Airport at 11:20am with a second flight departing in the afternoon at 15:40. All the existing carriers in the market have early morning flights, including an 8am departure from Suvarnabhumi for Bangkok Airways. Bangkok Airways also overnights an aircraft and crew at Chiang Mai, allowing for an early morning departure from Chiang Mai. This gives Bangkok Airways the ability to service business passengers from either city seeking to make a day trip. Bangkok Airways currently accounts for a 11% share of capacity between Bangkok and Chiang Mai, which is the second largest domestic route in Thailand. 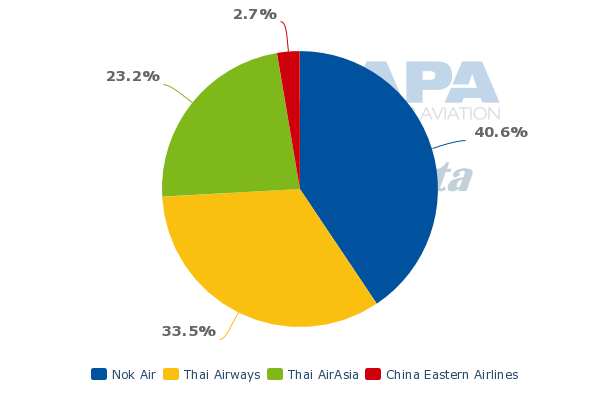 Thai Airways has a leading 40% share (includes some flights that are operated by Thai Smile) while Thai AirAsia has a 30% share and Nok has a 19% share, according to CAPA and Innovata data. Bangkok Airways sees its slot portfolio as an important differentiator as competition in the domestic market intensifies. When it adds a new route, such as Udon Thani or Chiang Rai, it has the slots to launch services with morning and evening peak hour flights. For example Udon Thani will be launched with departures from Bangkok at 07:25 in the morning and 18:45 in the evening. Matching the schedules of the incumbents could be a challenge for the start-ups, in particular Thai VietJet, as the carrier plans to operate from Suvarnabhumi rather than less congested Don Muang. Entering Phuket will also pose a challenge for the start-ups as new slots are currently not available except during overnight hours. While late night and very early morning slots can be used by international carriers, they are not conducive for carriers trying to expand domestically or serve the island from other Southeast Asian countries. Thai Lion seeks to serve Bangkok-Phuket, which is Thailand’s largest domestic route, but has not yet been able to secure slots at Phuket. Bangkok Airways is also keen to expand its domestic operation at Phuket, including launching service from Phuket to Chiang Mai. But until Phuket Airport completes an expansion project Bangkok Airways will have to make do with its current portfolio of 14 slots pairs. Until more slots become available, the domestic incumbents at Phuket have a competitive advantage. 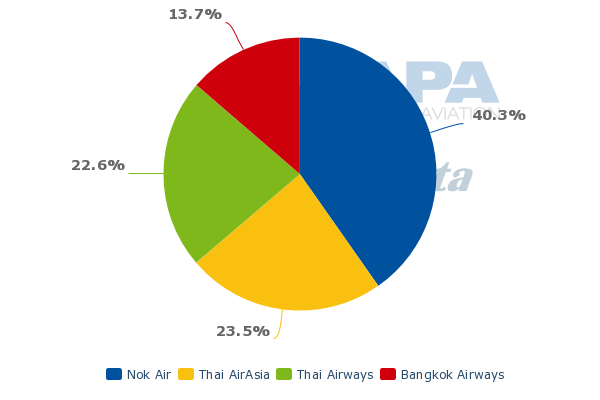 Bangkok Airways currently accounts for about 27% of domestic movements at Phuket, according to CAPA and Innovata data. In addition to serving the Bangkok-Phuket route, Bangkok Airways currently operates four daily flights from Phuket to Samui and one daily flight from Phuket to U-Tapao Airport near the beach resort of Pattaya. Bangkok Airways has the flexibility to add capacity at Phuket utilising its existing slots as all its Phuket-Samui and Phuket-U-Tapao flights are currently operated with ATR 72s. The carrier is planning to up-gauge several domestic flights from ATR 72s to A319s over the next few months, which will provide further increases in domestic capacity beyond the capacity being added through new routes and additional frequencies on existing routes. Most of the up-gauging of flights will involve Samui, which is Bangkok Airways’ second largest base after Bangkok. But it faces constraints due to a cap which limits the total number of daily movements at the airport to 36 because of environmental restrictions. Bangkok Airways owns the Samui Airport and has tried multiple times to persuade Thailand’s environmental bureau to raise the cap. Bangkok Airways President Puttipong Prasarttong-Osoth says the carrier is now planning a new submission with a re-calculated noise footprint. The opportunity to up-gauge flights comes as Bangkok Airways expands its A320 family fleet while keeping its ATR 72 fleet flat at eight aircraft. All five of the aircraft Bangkok Airways plans to add by the end of 2014 will be A319s and A320s. Bangkok Airways has been looking to renew its ATR 72-500s with new-generation ATR 72-600s but is not expected to grow the size of its turboprop fleet as it focuses fleet growth on larger aircraft. Capt Puttipong says the carrier will likely start with six ATR 72-600 orders but will consider acquiring eight or nine aircraft. He expects ATR 72-600 deliveries to begin in Nov-2014 and continue in 2015 and 2016. Bangkok Airways earlier this year considered a proposal to acquire Bombardier Dash 8 Q400s but Capt Puttipong says Q400s have been ruled out as it is too “difficult” to transition the fleet. “We would have to change the whole operation and technical. For the ATR we have experience for almost 30 years. We know the aircraft inside and out,” he explains. Bangkok Airways has also ruled out the Bombardier CSeries for its next-generation narrowbody requirement, deciding the new type is too small for its requirement. The carrier also does not want to acquire two types of jets and prefers to stick with two families of aircraft, one for turboprops and one for jets. Bangkok Airways is currently evaluating proposals for the A320neo and 737 MAX families. The A320neo is seen as the favourite given Bangkok Airways already operates current generation A320s. But Boeing in recent months has been aggressively trying to woo A320 operators in the region, including Royal Brunei Airlines. Bangkok Airways is considering a combination of purchases and leases but leasing companies will be needed to provide the early delivery slots. Bangkok Airways plans to eventually replace its entire A320 family fleet with new-generation aircraft. The carrier also anticipates continue growing its A320 fleet at a rate of about two to three aircraft per annum. But Capt Puttipong says that Bangkok Airways is always conservative with its fleet planning and never acquires an aircraft until it has identified an additional route or flight. As a result Bangkok Airways will likely stick to a relatively modest order to replace its A320 fleet, which will reach 20 aircraft by the end of 2014, with flexibility to expand should market conditions warrant. In recent years the carrier has been able to grow and maintain profitability. 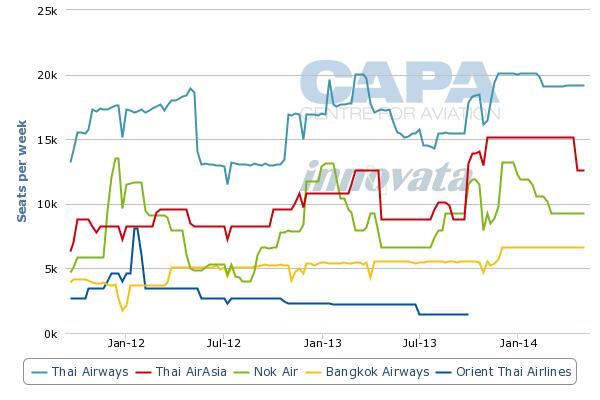 Bangkok Airways was profitable in 2010, 2011 and 2012 and is on track to again be profitable in 2013. Its main rival, Thai Airways, during this period has been up and down, returning to the red in recent quarters. Bangkok Airways expects to end 2013 with between 4 million and 4.1 million passengers, up from 3.6 million in 2012. Capt Puttipong tells CAPA the carrier aims to grow passenger traffic at an even faster clip in 2014 and reach 5 million passengers. The domestic expansion – including new routes to Udon Thani and Chiang Rai along with additional capacity across existing routes – will drive most of the increase. Bangkok Airways also plans to continue pursuing some expansion in the international market. Over the last couple of months the carrier has pursued significant international expansion in the Myanmar market, with the launch of services to Mandalay and Nay Pyi Taw and the introduction of a fourth daily flight to Yangon. In 2014 most of the international expansion will come in the second half of the year and consist primarily of additional capacity to existing destinations. As a result most of the capacity added for the full year will be allocated to the domestic market, which currently accounts for about 60% of the carrier’s total seat capacity, according to CAPA and Innovata data. Bangkok Airways is confident it can continue to stay on its current growth and profitability trajectory despite the intensifying competition in Thailand, which in addition to Thai Lion and Thai VietJet will also see the launch in early 2014 of new long-haul LCC Thai AirAsia X. Existing short-haul LCCs Nok and Thai AirAsia are also pursuing rapid expansion, using proceeds from IPOs. Bangkok Airways has been planning to follow Thai AirAsia and Nok with its own IPO. Capt Puttipong, whose family owns nearly 100% of the carrier, initially planned to list a 25% stake on the Stock Exchange of Thailand (SET) in Jun or Jul-2013. The IPO has since been delayed by additional SET requirements, but Capt Puttipong is now confident the listing can be completed by the end of Dec-2013. “There are only one or two issues with the SET. Hopefully this year we will clear,” he told CAPA. The hold-up has mainly focused on a request to clarify the company’s ownership structure. Bangkok Airways owns a portfolio of airports, with Samui Airport by far the most valuable, and it also has a joint venture catering company. All of the businesses are to be listed as one package but requires some consolidation to meet SET requirements. The plan is still to sell 730 million shares, including 520 million new and 210 million existing shares. Competition is also intensifying in the full-service sector from Thai Smile, which is now competing against Bangkok Airways on several of its core markets, as well as from foreign carriers. Bangkok Airways in particular has been facing new competition in Cambodia and Laos, two important and profitable markets for the carrier. Vietnam Airlines has pursued aggressive expansion in both markets, offering very competitive fares for passengers originating in Europe and looking to travel around the Mekong region. Cambodian flag carrier Cambodia Angkor Air, which is partially owned by Vietnam Airlines, has entered the Bangkok market. Lao Central Airlines has emerged as a second Lao carrier in the Laos-Thailand market after the country’s main flag carrier, Bangkok Airways partner Lao Airlines. Lao Central and Thai Smile are among several carriers which have launched in the Southeast Asia market over the last couple of years. Demand for air travel within the region remains strong but in many markets the launch of new airlines and ambitious expansion by existing players have resulted in over-capacity. The barriers to entry in Thailand are particularly low, making it relatively easy to launch an airline given the country’s liberal policies. Consolidation seems inevitable. But Bangkok Airways is well positioned as it has been in the market for nearly three decades and receives a steady and growing flow of passengers from its international partners.